The ink on her certificate as a Medical Technologist — the fancy name for Lab Technician — scarcely dry, Ann Foster finds herself with a choice of jobs. But the one that intrigues her most is the one none of the others graduating from City Hospital seem to want. Her friends, Midge, the twins Sharon and Karen, and Peter Davies, have found what they consider more glamorous jobs in the city. Glamorous or not, their salaries are considerably larger than the one offered Ann. But the rural section where Community Hospital is located appeals to Ann. Also, the fact that the people there have banded together to get a hospital for their town — and the doctor of their choice. It is not until Ann has accepted the job that she learns the doctor there — Dr. David Blair — is a nephew of her beloved Dr. O’Conner, the pathologist at City Hospital. 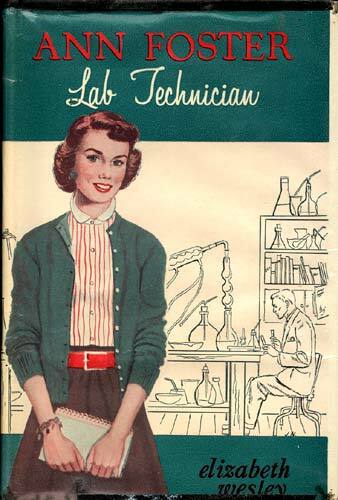 In her new position as an M.T., Ann learns that she must not only have the patience of Job, but that she must have the courage to face the doubt that sometimes shows up in a specimen brought to the lab for analysis. Such a doubt almost ruins Ann’s career before it is begun. But with her training under Dr. O’Conner behind her, Ann wins a secure place for herself in “her” lab at Community hospital in the career she has chosen. And, to make everything even more wonderful, the admiration of young Dr. Blair.